1. a supporting structure or tissue. 2. a couch or support for the body during sleep. bed blocks square pieces of wood placed under the legs of a bed to change its incline; frequently used when a patient is in traction. capillary bed the capillaries of a tissue, area, or organ considered collectively, and their volume capacity. CircOlectric bed [ser″ko-lek´trik] an electrically operated frame similar in principle to the stryker frame. It can be rotated so that the patient is in a prone, supine, or erect position; this facilitates turning of patients with severe burns, those in some types of traction, or those with various types of spinal injuries. Clinitron bed fluidized air bed. 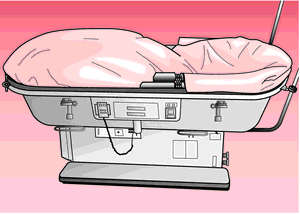 bed cradle a frame placed over the body of a patient in bed for application of heat or cold or for protecting injured parts from coming into contact with the bed clothes. Cradles vary in size according to their intended purpose and can be used over the entire body or over one or more of the limbs. flotation bed a waterbed or other fluid-filled mattress that distributes body weight evenly to minimize prolonged pressure in one area; used for immobilized or burned patients to prevent pressure ulcers. fluidized air bed a bed that minimizes pressure and distributes weight evenly over the support surface. A gentle flow of temperature-controlled air is projected upward through numerous tiny openings called ceramic microspheres. Called also Clinitron bed. Clinitron bed or fluidized air bed. From Elkin et al., 2000. Gatch bed a bed fitted with jointed springs, which may be adjusted to various positions. nail bed the area of modified epidermis beneath the nail over which the nail plate slides as it grows. 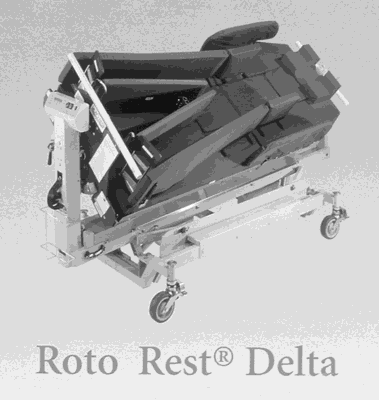 Roto Rest bed trademark for an oscillating hospital bed used in the treatment of a variety of neurological conditions in which the patient must be kept still and in alignment. The bed can rock slowly back and forth, thereby preventing some hazards of immobility. The patient is kept in place with a system of belts and specially designed pillows and packs. ROTO REST kinetic treatment table. ROTO REST is Kinetic Concepts' trademark for its oscillating bed. Courtesy of Kinetic Concepts, San Antonio, TX. vascular bed the sum of the blood vessels supplying an organ or region. 1. In anatomy, a base or structure(s) that support(s) another structure. 2. A piece of furniture used for rest, recuperation, or treatment. capillary bed the capillaries, collectively, and their volume capacity. nail bed matrix unguis; the area of modified epithelium beneath the nail, over which the nail plate slides forward as it grows. (in anatomy) a supporting matrix of tissue, such as the nailbeds of modified epidermis over which the fingernails and the toenails move as they grow. The most critical piece of hospital furniture, where a patient resides before or after a medical or surgical procedure, during a workup or whilst convalescing or awaiting transfer or discharge. The tissue interface that remains after debridement, evacuation of an inflammatory mass or the en bloc resection of a malignancy. Hospital care A unit of 24-hr Pt occupancy in a hospital or other inpatient health facility, which indicates hospital size. See Certified bed, Managed care, Observation bed, 'Swing' bed, Water bed. Abbreviation for biologically effective dose. 1. anatomy A base or structure that supports another structure. In anatomy, a base or structure(s) that support(s) another structure. the capillaries of a tissue, area or organ considered collectively, and their volume capacity. the area of modified epidermis beneath the claw, hoof or nail. Q. for how long can i use my eye contacts with out harming my eyes? can i go to bed with it? A. It is very much advised NOT to sleep with contacts, because of higher risks for eye infections that can be very dangerous. You shouldn't wear your eye contacts longer than a full day of work, and remove them when resting.